Milt Gross är smått genial. Er det Milt Gross!? Ja, han er super! Milt Gross (1895-1953), a Bronx-born cartoonist and animator, first found fame in the late 1920s, writing comic strips and newspaper columns in the unmistakable accent of Jewish immigrants. By the end of the 1920s, Gross had become one of the most famous humorists in the United States, his work drawing praise from writers like H. L. Mencken and Constance Roarke, even while some of his Jewish colleagues found Gross’ extreme renderings of Jewish accents to be more crass than comical. Working during the decline of vaudeville and the rise of the newspaper cartoon strip, Gross captured American humor in transition. Gross adapted the sounds of ethnic humor from the stage to the page and developed both a sound and a sensibility that grew out of an intimate knowledge of immigrant life. His parodies of beloved poetry sounded like reading primers set loose on the Lower East Side, while his accounts of Jewish tenement residents echoed with the mistakes and malapropisms born of the immigrant experience. 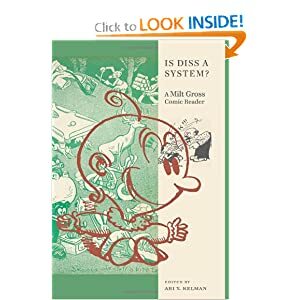 Introduced by an historical essay, Is Diss a System? presents some of the most outstanding and hilarious examples of Jewish dialect humor drawn from the five books Gross published between 1926 and 1928—Nize Baby, De Night in de Front from Chreesmas, Hiawatta, Dunt Esk, and Famous Fimmales—providing a fresh opportunity to look, read, and laugh at this nearly forgotten forefather of American Jewish humor. Ari Y. Kelman is an assistant professor of American Studies at University of California, Davis. He is the author of Station Identification: A Cultural History of Yiddish Radio in the United States.